MOST PEOPLE GO to Kabini hoping to spot the big cats, but only a few come back after taking a boat ride in the backwaters of the Kabini river, hitching a ride on a bullock cart, catching a sunrise over the flying technicolor birds, walking through some stunning marigold fields, chatting with the curious, yet shy tribals and watching a farmer plough the fields with his loyal bulls. Kabini is part of a larger protected wilderness area which includes Bandipur Tiger Reserve, Wayanad Wildlife Sanctuary and Brahmagiri Wildlife Sanctuary. Once a private hunting ground of the Wodeyar kings of Mysore and British officials, today Kabini is frequented by nature lovers and birdwatchers from around the world, with its forests teeming with over 350 species of birds. It is also one of the few remaining habitats for the wild Asian elephant. I was excited about my trip to Kabini, having kept my fingers crossed for a sighting of the elusive big cats, so I set out at 6am for a two and a half hour safari into the forests of Nagarhole National Park in a bus full of eager tourists like me, all hoping to spot a tiger or leopard. The calm of the forest is disrupted by the unappealing noise of our bus that is long past its date of service, but once I learn to tune it out, I start to experience the sights and sounds of the forest. I watch a herd of deer, quietly grazing by the side of the road. A fawn, barely a week old, snuggles up to its mother, while the stag looks up to see what is disrupting their breakfast. The sound of fluttering wings diverts my attention from the deer, and I see birds of vibrant green and blue flying in unison, almost racing each other from one tree to another. A beautiful peacock stretches on the trunk of a fallen tree, basking in the morning sun and doing his morning yoga. Suddenly, I see a flurry of activity up in the trees; it is a family of Gray Langurs swinging on their long tails and scouring the trees for breakfast fruit! From a distance, unfazed by the noisy bus and the clicking cameras, a wild boar continues sniffing the ground. To be unperturbed by the paparazzi is a skill that the Indian bison has not mastered, and he hides in the bushes, peeking from in between the branches, until we pass. And then, the moment I had been waiting for—a possible tiger spotting! Or so I thought, until I spotted a deer racing deeper into the thicket and out of sight. Unfortunately for me, the big cats, who are choosy about their audience, did not grant us an appearance. After the safari, I take a boat ride through the backwaters of the Kabini river. The boat’s roaring motor triggers a technicolour air-show of startled birds in the sky. After the initial excitement of water splashing my face, I notice the most stunning expanse of manmade green I have ever seen—hectares of beautifully maintained farmland being tended to with the utmost care! 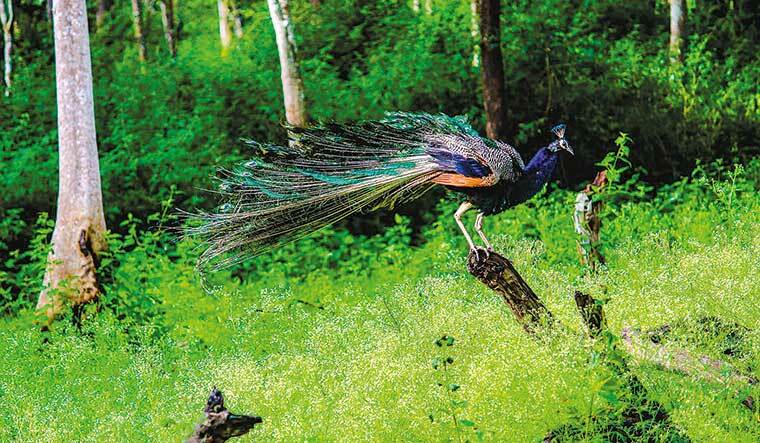 The sight of the velvety green splashed with orange marigolds seemed reason enough to visit the village of Kabini, which is a feast for your senses. There is the irresistible smell of freshly-ploughed earth, the sound of children running with their herds of goats and cows, and the sight of the farmers driving their bulls in the fields. A beautiful peacock stretches on the trunk of a fallen tree, basking in the morning sun and doing his morning yoga. I go there with a local man, who, to my surprise, begins conversing with me in my mother-tongue Malayalam with an ease uncommon in non-Malayalis. Apparently, he learnt it during his days selling cattle in Kerala. He tells me that the marigold flowers have been recently cultivated for their coveted essential oils, which supplement the income of the struggling farmers. The neighbouring resorts also help by providing employment to the locals and by purchasing the farmers’ produce. He takes me to meet some naughty and curious tribal children at the Viveka Centre for Tribal Learning, which provides free education to the children, as well as accommodation and food to the boys. I also visit Health EnRich, a health food enterprise run by the local tribal women that helps sustain the farmers by being their largest buyer of ragi. It is easy to fall for the charm of these new-age tribal women, as I come back with a bagful of tasty ragi treats! The tribal women’s collective is trying to preserve the age-old traditions of the tribal community by teaching them to the new generation of tribals. I was fortunate to watch a tribal dance, which was surprisingly performed by men! Its choreography mimicked the dance and music performed at a tribal wedding and funeral. 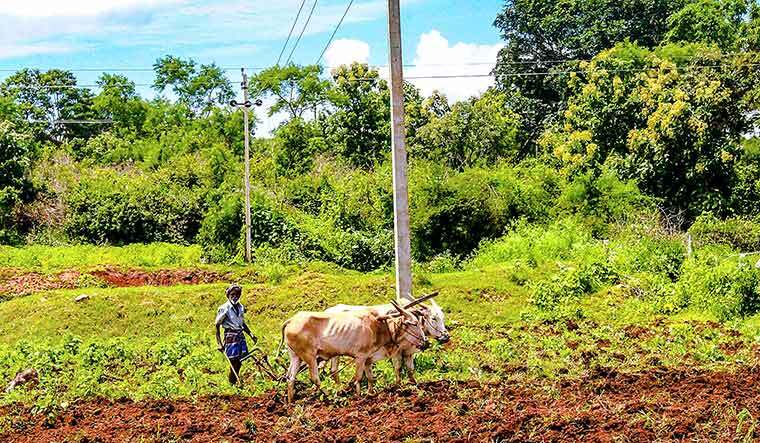 To see a people content with the life of bullock cart travel, hand water pumps and hand grinding of grain is an experience that encourages city dwellers like me to slow down and appreciate life.